The other day I mentioned Rob Fitterman's new conceptual poetics project, and got a lot of positive response to it. 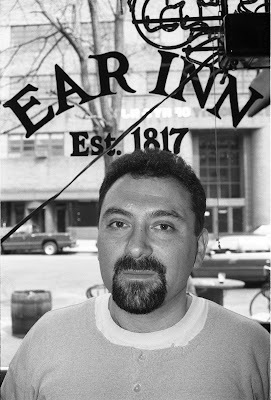 My favorite literary photographer (as regular readers of this blog already know), Lawrence Schwartzwald, found this wonderful photo of Rob standing in front of the Ear Inn. We think the date was January of 1992.